Also, may I ask, whose armor is that supplied from? eBay? I don't quite recognize it. No go. Black Series only one so far. I have to admit, when I heard of the news, I was freaking the hell out, like Noo! Don't you dare 2016! Christmas? Well, Happy Life Day mate! Why are stormtrooper commanders using jedi armor? Heard about that, playing the game, I can see they really wanted to make it look similar to an ANH armor in certain maps, but they can only do so little when they have a model that looks nothing alike... 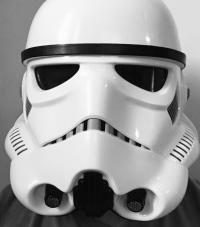 Although, the sand trooper helmet model they did looks gorgeous. I really prefer the ANH armor though. It looks wrong to have rotj armor placed in maps based off other movies >.< Imagine putting a snowtrooper on Tatooine. I did...<br><br> Had missed out the first 5 minutes, because 3D wasn't -laying right... ermm.. went up managers, offered refund while we got to watch it in a different cinema for free...The screen was bigger, much better IMO... it was like IMAX, but it was called regular? wtf...<br><br> Now the story... I was extremely dissapointed... Now this is just my opinion, It was a good film... but it just didn't have that star wars flavour... to me it was just another sci-fi for some reason... I loved the end, a good nod indeed... But the film itself? Just seemed like a story you'd see on some japenese cartoons/animes... <br><br><br> *Spoilers*<br><br><br><br><br><br><br><br><br><br> We're clear... So, the deaths... Umm... I didn't feel any sad about any of the characters that died... Usually I would in a star wars film, like Ep 4-7 but this? The character development just felt off... Anyone with me? The thing at the end with scarif and all... Just what? Comeon, play some sad music, and make it more painful to watch...<br><br> I was really hoping for the dark lord of the sith to be more brutal and act more naturally like the original body actor... The pun he made wasn't funny nor menacing... Seemed to force on the whole, Hey, I'm a dark lord! Scary scary!<br><br> Hmmmpphh... As much as I wanted to love it, the trailers 1 & 2 summarized it for me. It just spoiled the experience. <br><br> Good movie in some areas, others it was so force to make it feel like star wars, it was no longer star wars...<br><br><br> Yes, it was fresh and new, but was the chnage of tone justified? I wanted the charcters to have a better ending... (If you know what I mean...:CutsInHalf:)<br><br> Now the death star... No... just No... If it took alderaan about 2 seconds to be blown up, how come it took scarif bloody minutes? Felt like an hour. They're not going to do it. Their reputation will drop considerably and the sharemarket will go down. As humper said, some things just shouldn't be remade.<br><br> I mean, comeon, many kids nowadays ( i use to be one 0f the,) Didn't even know some movies had an original movie, and find the original to be boring because of camera quality, or not enough fight scenes (Yeah, I was biased back then) I loved the prequel trilogy for stupid reasons, now I prefer the original trilogy, because I can fully understand the dialogue and the love for the movie. As again, why would you remake a movie that was practically perfect? It wouldn't be called the original trilogy anymore, it would just be the remake trilogy. Are we seriously going to ruin peoples legacy? In the future, they might not even know who tf is harrison ford, mark hamill or carrie fisher. Don't forget the hundreds of extras and stunt actors who contributed their moments to be imbedded in our minds. Especially the trooper who knocked his head on the door... Or Sir Alec Guiness. Looked upon as a great actor and observer. I only started collecting figures this year, so tracking down the old lines is hard, especially since the bootlegs are everywhere... Luckily, it's easy to tell bootlegs apart, they almost always never have a neck hinge.